On December 6, 1917, the French munitions ship, S.S. Mont Blanc, collided with the S.S. Imo, a Norwegian ship carrying war supplies, near Pier 6 in Halifax Harbour. The resulting explosion killed 2 000 people, as well as leaving many more injured and/or homeless. The Halifax Relief Commission supplied funds to create Fort Needham Memorial Park, overlooking Richmond Street which leads to Pier 6. Today the park is still a popular recreation area, and contains this memorial bell tower, designed and dedicated in 1985 to look like the jagged ruins left after the explosion. The tower includes a distinctive upward thrust which represents hope for the future, and contains a set of church bells that formerly hung in the United Memorial Church - once shared by both Methodists and Presbyterian congregations after both of their churches were destroyed in the Explosion. 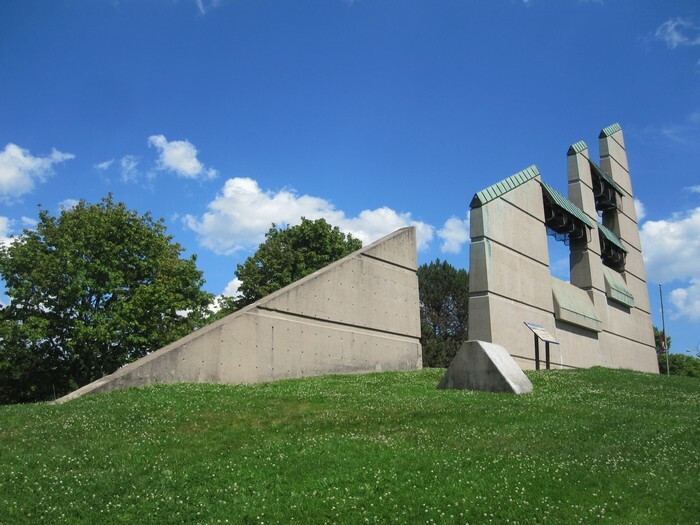 The Halifax Explosion Memorial Bell Tower stands as memorial to all those who lost their lives or suffered injuries in the Halifax Explosion, and to the survivors who helped rebuild the city.